Whac-a-mole! Hammer Kingdom is a bright, colorful, glossy clean game app based on the classic carnival/arcade game. 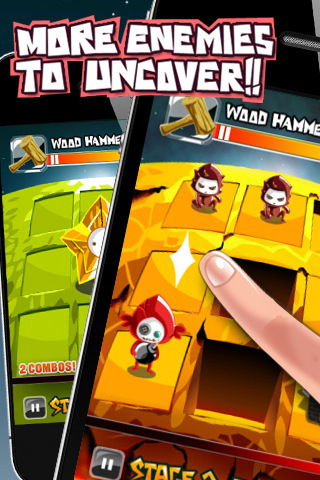 Available on the iPhone, iPod touch, and iPad, Hammer Kingdom is developed by Mobomotive and sells for $0.99 in the App Store. Hammer Kingdom is a beautifully done Whac-a-mole game where little cute alien things pop up from a 3×3 grid field and you tap, slash up, or shake your i-device to beat them up. Artistically, this is a fun and visually dynamic game with great character designs, playing fields, and even the title screen is bright and gorgeous. The little aliens have different attributes attached to each of them. Some just require a single tap, some require you shake the screen first in order to tap them, some damage you unless you slash them up or down first and then tap them, and there are aliens that require multiple, rapid taps to beat up. The pacing is fast and extremely challenging, the bosses are clever and really frantic sometimes, and the controls are quick to remember since they introduce new concepts slowly. There are flaws however. First I’d like to mention a minor gripe I had. There is an item shop for you to use. Here, you can purchase health upgrades (a better hammer) or health healing items. That sounds fine and is a welcome feature, but this shop can only be accessed when it randomly appears on the playing field during gameplay. Imagine a frantic tap fest with shaking and slashing all over the place. You have been gathering money from beating down enemies and suddenly BOOM, item shop and you just spent money on a one-time-use healing item while your health was full. Hurray, you wasted a ton of money… this is a minor flaw in my eyes, but I feel it should be a button or maybe a random health item should pop up on the field during gameplay so the gameplay isn’t suddenly interrupted. Another flaw I ran into was a random crash. There was a boss where a giant star appears and you rapidly slash it. It splits into 9 little star guys who you have to slash first then you rapidly tap the boss in the center until it dies. Repeat. The boss fight was unique and pretty fun until about the 3rd giant star split into 9 star guys and the game crashed. I was left looking at my home screen… I went back to find that my progress was saved thankfully under the stage select screen, but crashing of any kind should be pointed out. And no, this was not a repeated crash as I ended up beating the stage after I started the app up again. The crash did not ruin Hammer Kingdom for me. 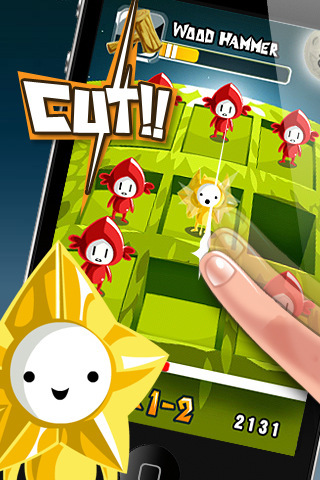 This is still a wonderfully beautiful app with a great style and excellently executed gameplay style. Since the is still a version 1.0 at the time of this review, give Mobomotive a chance and purchase Hammer Kingdom. A minor and rare ‘crash to desktop’ is not enough to ruin the fun, fast, and cute style. Hammer Kingdom is a keeper! AppSafari review of Hammer Kingdom! was written by Joseph Ho on June 10th, 2011 and categorized under Action, App Store, Arcade, Featured, Games, Time Management. Page viewed 5662 times, 1 so far today. Need help on using these apps? Please read the Help Page. Hammer kingdom is quite a challenging game. Sometimes your hand will get too busy tackling all the different aliens, however it’s fun and it’s a lot more interesting than thick lips.